😦 I already do not like the “new” activity menu, and having to go to a sub-menu to find “comments you made,” instead of having it right there in the side bar on the “my account” page. Every time you change something like this, and create extra steps to find something that used to be up front, it adds time to what we are trying to accomplish in writing our articles, or finding and referencing other articles. Instead of changing the working layout for us writers, why not make that bar at the top invisible to all but the owner of that account. I like it– neater and cleaner, but what happened to the feed? Is that out now, or just a temporary shutdown? OK I found it– but there’s only a ‘home’ button on a page with the old header– like this one. I like the new design as it is more compact and user friendly. Header is now rearranged in more professional style. Thanks for the feedback, y’all! I’m glad most of you are happy with the feature. 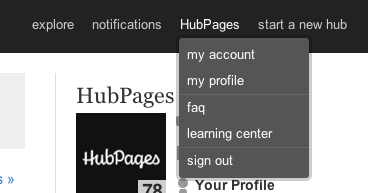 Kris, the feed is still present- all you have to do to get to your homepage is click on “HubPages” in the header. Sally’s Trove- we removed it because very few people clicked on it, and we intend to better feature authors on Hubs so that people are discovered through their awesome work and not out of context. I noticed the new header. I think it looks sharper. Didn’t take much effort to figure it out and find what I wanted. I am able to deal with change, though I was used to the other format and liked it. What I do not like is, I cannot close out of my account unless I work my way from my profile to my account to the learning center so I can work my pointer down between the forefront in order to close out. My choices are all behind everything else. Please fix this!